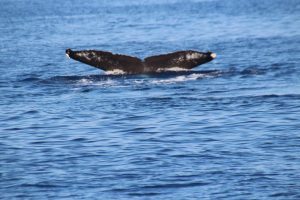 We operated just one Whale Watch Cruise on Tuesday — our Wake up with the Whales Cruise. We found a trio of adult Humpbacks (is that called a “tri-pod??) hanging out together offshore of the Mauna Lani/Fairmont Orchid area. These three were on a cycle of 6-8 minute dives, so we got to see a lot of them. Most of the time they were about 250 yards from us, but at least once when they surfaced they surprised us from about 100 yards away. When they sounded each time, they didn’t slip under the water — instead, they lifted their flukes high into the air, giving us some great views of those unique tail patterns. We deployed the hydrophone twice during this cruise but we didn’t hear much at all…so maybe those male Humpbacks are already heading back to Alaska. Ocean Sports Whale Fact of the Day: Recently, researchers observing populations of singing male Humpbacks were able to determine that immature males will join mature males in singing. The researchers theorize that the entire Humpback population benefits when more males are singing, suggesting that every voice is important as a means to attract females to the “arena” where the males have congregated. Since we know that the females don’t respond to an individual male’s song – it’s not like a songbird’s song, designed to attract a female and repel other males – the researchers theorize that the Humpbacks’ songs are meant to attract any and all females, which in turn, would increase mating opportunities for mature animals regardless of gender. Though the immature singing males may not get an opportunity to mate, they derive benefits too, since they get to learn the prevailing songs and the social rules of mating. In case you’re curious, these researchers based their determinations of the whale’s maturity level on its length – 11.2 meters or 36’9” was determined to be the length at which male humpbacks reach sexual maturity…and this cut-off was based on research done by biologists in the US and Japan who were able to determine sexual maturity based on the weight of the whales’ testes.